Bermuda Skyport Corporation, Aecon Group and the Bermuda Department of Workforce Development [DWD] announced the start of the Airport Redevelopment Project internship programme this week. 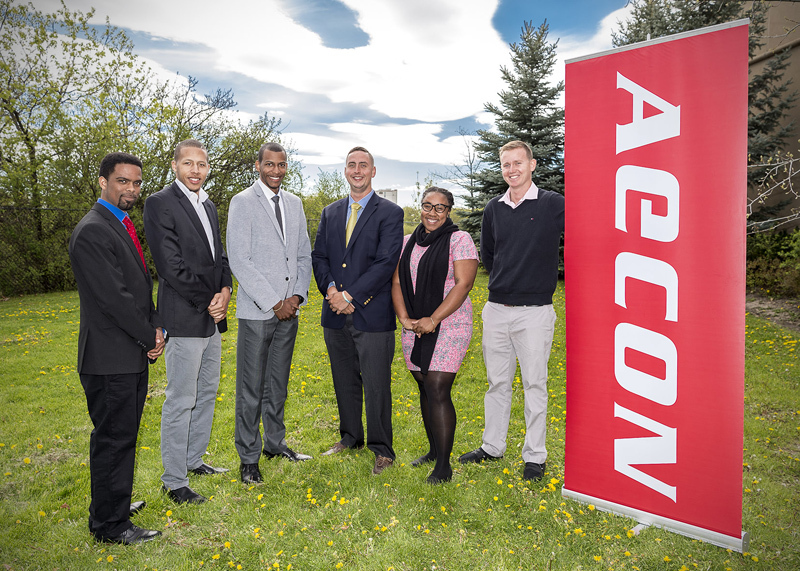 As part of the project, six Bermudians have been offered paid internships with Aecon and members of its technical team in Canada. The interns were chosen by a panel of interviewers from Aecon and DWD. Je-Shae Pace, a 26-year old graduate of the University of Brighton, held a leadership role in project management while at university and worked as a security screener at L.F. Wade International Airport during her summer holidays. Je-Shae will be working for Scott Associates Architects to gain experience in the field of architecture, which she studied at university. Barak Bremar, a 23-year-old graduate of the New England Institute of Technology. Barak has worked at L.F. Wade International in six different departments over a six-year period – most recently as a skycap. Barak will be working with Mulvey & Banani International as an electrical design intern. Owen Chisnall, a 22-year-old graduate of Niagara College is a committed Bermudian volunteer who is working to help maintain and rebuild Trunk Island. He will be spending half of his internship with H. H. Angus and half with Aecon in order to gain experience in the fields of mechanical engineering and project safety. James Gould, a 24-year-old graduate of the University of Plymouth has been working for Kaissa as a junior roof installer and assistant superintendent. He will be working for Aecon and gaining experience in construction management and safety. Ricardo Graham-Ward, a 24-year-old graduate of the University of Southampton, has been working for the Bermuda Government as a Trainee Civil Engineer. His internship with WSP Global and Quinn Dressel Associates will allow him to further his career in civil and structural engineering. Jordan Lawrence, a 20-year old graduate of the New England Institute of Technology, has proven himself to be hardworking and dedicated and has recently returned home to Bermuda. He will be spending three months each with H. H. Angus and Aecon gaining invaluable experience in mechanical engineering and construction management. “The interns will spend their time with their host company working on tasks specifically related to the Airport Redevelopment Project and other activities carried out by their host companies, as well as regularly scheduled visits to Aecon where they will participate in a series of dynamic training programmes,” the announcement said. “They will each be assigned a mentor who will help them to create and complete an individual development plan throughout the programme and to ensure that they get everything they can out of the programme. Frank Ross, Executive Advisor, Aecon Group Inc., said: “We are very pleased to be starting the internship programme in Toronto this week. We look forward to introducing these six, intellectually curious interns to our design and architecture partners in Canada and to the Aecon team. Still not good enough……..some will say.